Take the perfect picture with Solid State Photographic Lighting equipment. The center piece of our image capture system is our ability to activate thousands of watts of energy in literally a split second, and shut down once image capture is achieved. By installing our RF transmitter onto the Hot Shoe port of your camera, when you snap a photo, a wireless signal is sent up to 100 ft. away to the receiver in the Nite Flo 400 control unit. Once the signal is received, the control unit turns on the light array for a preset amount of time programmed by the user. By limiting light activation only to the desired time frame, we conserve power and extend the fuel reserve of portable generators. We've designed this powerful unit to be compact, portable, and durable using a composite plastic enclosure. A vented fan inlet keeps the unit cool for hours under extreme heat, and an internal heater keeps the unit operating in extreme cold. The STB-50/50 is a free running, asynchronous strobe driver. 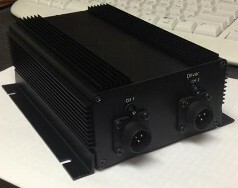 Rather than a pulsed input, this unit simply turns on and off at a duty cycle of 50%, and frequencies from 10Hz to 1000Hz (custom frequency range available) This unit is perfect for freeze frame types of applications where the user needs to perform image capture of an oscillating or vibratory target. By adjusting the frequency of the strobe affect, you can slow down, or freeze the visual appearance of the target. The '600' is identical in function to the '300', however, we have designed in an internal cooling system which increases the operating range of the unit so that we can avoid going into the Standy mode, and keep your critical automation processes going. We have kept the Overtemp function the same, and have improved overall performance. Extend the reach and capabilities of your engineering department with our custom design services. We're a perfect fit for small to mid-sized companies that don't have a fully staffed engineering department. Send your electrical engineering proposals to us for bidding and we'll be sure to impress with our quick product development turnaround time.